I only discovered Maud Hart Lovelace after I started blogging. Her Minnesota-set Betsy-Tacy series of children’s books have insipid titles that would have earned my contempt if anyone had tried to press them on me when I was young (Betsy and Tacy Go Over the Big Hill, Heaven to Betsy, and Betsy Was a Junior) but she had so many fans in the book blogging world that I had to try her for myself. I started with a non-Betsy-Tacy book (Emily of Deep Valley) and thought it was fine. At the time, I remarked that I didn’t think, based on the brief glimpse of Betsy provided in Emily of Deep Valley, that I could face any of the books focused on her. But then I found a copy of Betsy and the Great World for sale at the library for 50 cents and decided to take a chance. After two years of university, Betsy Ray has had enough. She convinces her parents that, as an aspiring writer, she is not getting a lot of value from her math and science classes. They agree and instead offer up an education of a different sort: a year abroad, travelling in Europe. (Note: this was not the offer my parents made to me whenever I complained about my university classes. Tragically.) Unsurprisingly, she is ecstatic and, in possession of a flashy wardrobe and lots of enthusiasm, she sets off for Europe. It is January 1914, she is twenty-one years old, and the world seems full of possibilities. The book follows Betsy through her shipboard adventures, her travels on the continent (Germany, Italy, Switzerland, France), and her arrival in England – just in time for war to be declared. Through it all, she does her best to make new friends and keep up her writing even as she struggles with homesickness and a longing for Joe, the boyfriend she had parted from before leaving and is now fearful of having lost forever. The highlights of the book for me were the descriptions of the places Betsy visits. Betsy herself was wildly uninteresting but I loved hearing about her walks through Munich, her wanderings around Venice, and her instant love affair with London. The only part of Betsy’s journey I did not enjoy was her brief stay in Oberammergau, where the piety of the citizens, many of them actors in the village’s famous Passion Play, was taken far too seriously by the young American (and her creator). Though I developed absolutely no interest in or attachment to Betsy over the course of the novel, I was impressed by Lovelace’s descriptions of Betsy’s mood changes and the frequent waves of homesickness that plagued her. Lovelace has a disarmingly honest was of talking about unpleasant or negative emotions (which were also a feature of Emily of Deep Valley). But there were things that outweighed the honesty and the enchanting travel details: so much of the story is focused on Betsy’s new friendships (both platonic and romantic) and the episodic and repetitive nature of these relationships felt lazy. Yes, Betsy seems to be a young woman who makes friends (and conquests) easily but I longed for some more substantial development. Her need to surround herself with a group of people, to form a clique (or, in her words, a Crowd) in each new place, saddened me. By the end of the book, Betsy has seen many places and had many wonderful experiences but it is not clear how much she has actually learned, particularly about herself. There is one feature I cannot decide if I should classify as a positive or a negative: Betsy’s garish wardrobe. Maud Hart Lovelace describes her heroine’s costumes in loving detail and the vast majority of them are awful – laughably so. Betsy has a particular fondness for a red-green hat, worn with a pale green dress and a scarlet jacket. There is also a matronly-sounding maroon silk evening dress. And she wonders how people know she is an American even before she speaks! The illustrations don’t help either, making her look either ten years behind the fashions or forty years ahead of them. Clearly, this was not an instant favourite with me, though there is something intriguing about Lovelace’s writing, though it is very uneven. I am even a little bit tempted to read the final Betsy-Tacy book, Betsy’s Wedding. But while I can somewhat stomach grown-up Betsy, the idea of reading about her childhood escapades sends a shiver up my spine. No. Just…no. I cannot face that. So funny, I loved ALL of the Betsy books when I was in 3rd grade. I could not read them fast enough. I wonder how I would feel about them now? 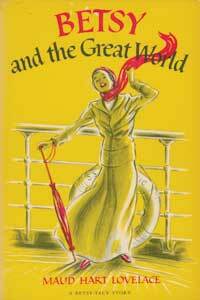 If I were to be a card-carrying member of any society, it would be the Betsy-Tacy Society (yes, there is one!). 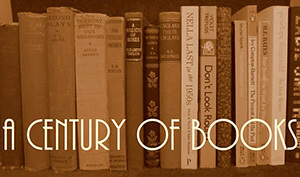 I flat out love those books! I think the best ones are the middle ones (Heaven to Betsy, Betsy in Spite of Herself, & Betsy Was a Junior) since those books are a full picture of the Ray family, the town, and the school (the Essay Contest!). Colors which look terribly garish to modern eyes were the height of fashion in their heyday. I’ve seen some Victorian/Edwardian wallpaper that would make you want to pluck your own eyes out. And the colors they used in their houses (and clothes) – holy moley! My favorites are also the high school books (I like Betsy Was a Junior and Betsy and Joe), which are based on Lovelace’s own high school diaries. Betsy’s Wedding isn’t as strong a story, but I still think it’s fascinating. My copy of Betsy and the Great World has a photo of Maud on her European tour wearing what has to be that red and green cap — the one that can be stuck into all kinds of “interesting shapes.” It’s not bad in black and white! I love Emily of Deep Valley. I think it is one of the finest young adult books around. I gave the first book to my niece – who received it with utter disdain! I love the Betsy books!!! I would highly recommend them to anyone.